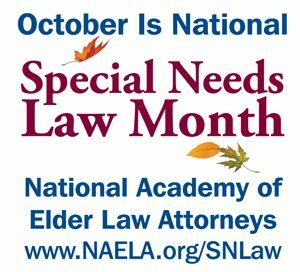 The National Academy of Elder Law Attorneys (NAELA) has designated October as “National Special Needs Law Month.” Special Needs Law attorneys throughout the country contribute a great deal to their communities by educating those with special needs, their families, and caregivers about their legal needs. The program is part of a nationwide observance of National Special Needs Law Month during the month of October, sponsored by the National Academy of Elder Law Attorneys (NAELA). Headquartered in Washington, DC, NAELA was formed in 1987 in response to the growing needs of older adults and people with disabilities in coping with the legal problems of aging and special needs. Other programs throughout the United States will include: seminars in financing long-term care; seminars in legal tools for financial management, such as powers of attorneys and trusts; seminars in understanding Medicare and Medicaid; discussions of special needs trusts and a student’s right to an independent educational plan; discussions of public entitlements such as Social Security and Supplemental Security Income; discussions of housing options; and other issues with which local special needs planning attorneys feel the public should be familiar. Membership in NAELA has grown to more than 4,300 members since its inception in 1987 commensurate with the continuing national advocacy for people with special needs. Unlike traditional lawyers, special needs planning attorneys focus on with their clients “holistically” – helping with the issues that affect a particular segment of the population rather than a particular area of law. When clients visit a special needs planning attorney, they generally present problems beyond the need for a will or a power of attorney. 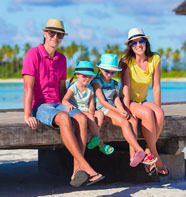 Special needs planning attorneys are familiar with the multifaceted aspect of this complex area of the law, as well as a network of services and providers who assist clients effectively. NAELA devotes much of its resources to education of its members and the public. Special needs planning attorneys must constantly monitor the ever-changing statutes and regulations to which people with disabilities are beholden for their daily existence. 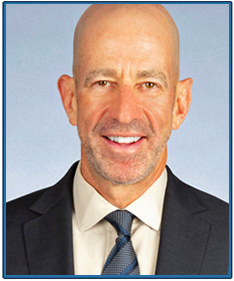 Littman Krooks managing partner, Bernard A. Krooks, Esq., is past President of the National Academy of Elder Law Attorneys (NAELA), a Fellow of NAELA, past Chair of the NAELA Tax Section and past Editor-in-Chief of the NAELA News.